A review of aircraft accident data shows that about twenty percent of all general aviation (GA) accidents occur during takeoff and departure climbs. Further breakdown of the data indicates that more than half of those accidents were the result of some sort of failure of the pilot, and twenty percent of the mishaps are the result of loss in control of the airplane. When compared to the entire profile of a normal flight, this phase of a flight is relatively short, but the pilot workload is greatest. This chapter discusses takeoffs and departure climbs in airplanes under normal conditions and under conditions that require maximum performance. Though it may seem relatively simple, the takeoff often presents the most hazards of any part of a flight. The importance of thorough knowledge of procedures and techniques coupled with proficiency in performance cannot be overemphasized. The discussion in this category is centered on airplanes with tricycle landing gear (nose-wheel). Procedures for conventional gear airplanes (tail-wheel) are discussed in the category titled Transition to Turbopropeller-Powered Airplanes. The manufacturer’s recommended procedures pertaining to airplane configuration, airspeeds, and other information relevant to takeoffs and departure climbs in a specific make and model airplane are contained in the Federal Aviation Administration (FAA) approved Airplane Flight Manual and/or Pilot’s Operating Handbook (AFM/POH) for that airplane. If any of the information in this category differs from the airplane manufacturer’s recommendations as contained in the AFM/POH, the airplane manufacturer’s recommendations take precedence. Takeoff roll (ground roll) is the portion of the takeoff procedure during which the airplane is accelerated from a standstill to an airspeed that provides sufficient lift for it to become airborne. Lift-off is when the wings are lifting the weight of the airplane off the surface. In most airplanes, this is the result of the pilot rotating the nose up to increase the angle of attack (AOA). 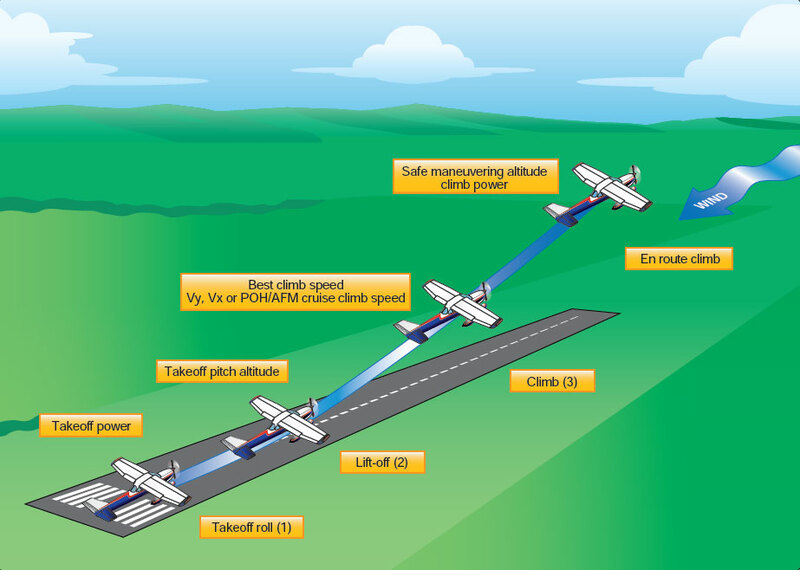 The initial climb begins when the airplane leaves the surface and a climb pitch attitude has been established. Normally, it is considered complete when the airplane has reached a safe maneuvering altitude or an en route climb has been established.